The music fills my head and heart and I take a deep breath and open my mouth and I sing! It’s heaven. Heaven! I feel like I’m dreaming—a little boy dreaming about being in a recording studio, recording an album. Except this isn’t a dream. It’s real. Very real. I hear my voice coming back at me, cutting through the music. I hear my mistakes. I flub a lyric. I hear myself starting to run out of air. I tell myself, “Just stay with it, Jason. You can do this.” And then the trial run is over. “Ok!” the engineer’s voice comes back over the speakers. “That was great. How did it feel?” I can see him and the music director/composer through the thick glass that separates the recording booth from the control booth. I smile and give them a thumbs up sign as I grab my water bottle and take a gulp. I’m having flashbacks to another time in my life. Before Hawaiian music became my world. Before I’d visitied Molokai for the first time. Back when singing musical theater songs was what I did daily. See, I’m not in the studio to record a Hawaiian album. 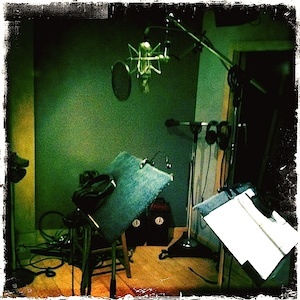 I’m there to record some vocals for a character in a new musical that’s being developed. My friend, Don, is one of the composers/writers of the show and he’s asked me to be a part of the conceptualization of the project. He is a major figure in the musical theater world. I met him years ago at an open call for a Broadway musical—he was the musical director. We became fast friends and he booked me for a couple of workshops for new shows. Shows being developed for the stage. And they were my favorite experiences in the theater. Ever. But now that I’m standing here with the incredible musical score in front of me, I’m wondering if I still have it in me. And I’m kind of surprised. Yes, I sing daily. I mean multiple times a day. In fact, I’m probably guitly to signing ALL DAY LONG while I go about doing my daily chores, while I’m out walking on the street, etc. But I’m mostly signing Hawaiian music these days. It’s the music that I’m most familiar with now. Pops has been teaching me proper phrasing for Hawaiiain music—how to sing the lyrics so that they make sense. And along with that, I’m learning how to breathe in order to sing those phrases, how much to inhale, how to conrol my diaphragm to execute the Hawaiian song well. Yes, musical theater uses these same elements. But musical theater requires that you do these things a little differently. I’m still trying to determine what the differences are in my mind. I just know that it feels different. I breathe differently. I use my voice differently in order to project the clear, bell-tones that are required. (Especially for this character.) Fatigue sets in quickly. I remember the first time I sang Hawaiian music with Pops. And now, here I am: back in New York and singing Musical Theater music with an old friend. I tell myself exactly the same thing I’d told myself when I’d sufferred from laryngitis in Hawai’i: This isn’t about YOU, Jason. It’s about the song. It’s about expressing the music. Let go. Let the music speak. We do what feels like a million takes. I try singing the lines/lyrics a million different ways. It is such an honor to be even a small part in this new show’s journey from an idea to a staged production. And so much fun to sing like this, again! It’s about the music. We singers are the lucky folks that help bring that music to life. Last night James and I went to see New York City Ballet’s production of George Balanchine’s The Nutcracker. A friend gifted us with tickets. (A nice friend to have, for sure!) I’d never seen The Nutcracker except for a few selections that I’d seen on television. And it was being presented at the David H. Koch Theater at Lincoln Center. It was kind of a “fancy affair.” Not tuxedo-fancy. But dressier than my usual Aloha shirt and jeans. I had never been to a ballet before! This was kind of like stepping through a window in time. My college years were spent in a fantastic conservatory program at Carnegie Mellon University. That’s where I received my BFA in vocal performance. For four years, I was surrounded by classical music. In truth, classical music wasn’t a great fit for me. I mean, I learned to love aspects of it. (I still get all choked up listening to certain operatic arias.) But it didn’t take me long to realize I was probably not going to make my living by performing in an opera house. It also didn’t “fill the void” that I had inside me. Hawaiian music and hula fill that void. It is the niche I’d been looking for. Nothing else has ever made me feel so fulfilled. I’d left the world of classical music and dance to pursue a different path. But The Nutcracker was like stepping back into once-familiar territory. I was delighted and anxious. Would I still be able to understand it? Would there still be aspects that made me itchy? The education I’d gotten from school allowed me to enjoy the performance from several different viewpoints. At times, I concentrated on the dancers and their carefully choreographed movements. Other times, I found myself captivated while I watched the musicians create musical envelope for the performance. Musicians and dancers were of the highest caliber, for sure. However, at times I still felt uncomfortably lost in my own mind, deep in thought. Hula exists because of the words. The dance illustrates the lyrics. The music supports the lyrics. The music and the dance work together–symbiotically–to bring the words to life. The Nutcracker has no words. Ah! It was like someone had turned on the lights in a dark room. It wasn’t about comparing this performance to Hawaiian music and hula. It wasn’t even about remembering some of the difficult times I had as a student in the conservatory. This moment was about watching these amazingly gifted and dedicated performers put together an incredible performance. Once I realized that, I was free to let go completely. Watch with “fresh eyes.” Experience something new. Immerse myself in the joy and richness of the production. What a great way to help ring in the holiday season! P.S. I came home and downloaded The Nutcracker. Now I can listen to it and relive the magic over and over. P.P.S. As soon as we walked out of the theater, I untucked my shirt.